Have you seen pictures of apple nachos all over the interweb? Have you tried them? No? Run right out and buy some 'fixins' and whip up this quick and easy snack! I pinned the idea from this site and then went to town with toppings I already had in my pantry. I used Macintosh apples because they are my favorite, sliced thinly and layered on a plate. 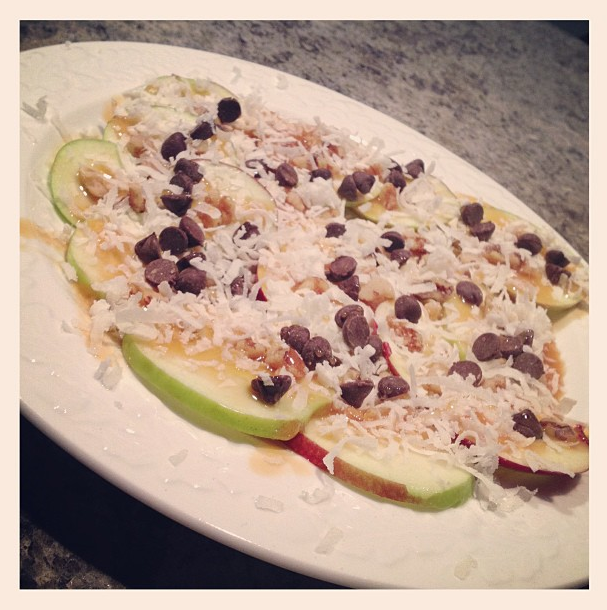 Then I drizzled the apples with caramel sundae sauce, followed by coconut flakes, chopped walnuts, and chocolate chips! Sooooo yummy and sooooo easy!